⇒⇒ We Sell Custom-Processed Whole Lambs and Half a Lamb — from our farm to your table. ⇒⇒ Taking orders for your 2019 custom-processed lamb. ⇒⇒ 4-H Market (Project) Lambs Available for Your County Fair. ⇒⇒ 4-H Ewe Lamb Leasing Program — at no cost to the 4-H’er. 30-40 lb. whole carcass: $7.95 lb. — order your Greek Easter lamb now, Hemp’s need 7-10 days for delivery. 40-50 lb. whole carcass: $6.95 lb. 50-60 lb. whole carcass: $5.95 lb. Custom-Processed Lamb — also called Freezer Lamb: whole or half lambs for roasts, bone-less roasts, steaks, chops, rack-of-lamb, kabobs, etc. — also, lamb for a BBQ — lamb sausage — and lamb burgers. Click on the “How to Purchase” tab for details. 4-H Project (Market) Lambs for 4-H’ers to show at their County Fairs. Click on the “How to Purchase” tab, scroll down to #4 for 4-H project lamb details. 4-H Lamb Leasing Program is available — lambs are leased to 4-H’ers for the summer, to show at their County Fairs — at no leasing cost to the 4-H family. Our way to help kids enjoy having a ewe or ram for the summer, without the expense. Registered Ewe & Ram Breeding Stock — 2019 lambs, and 2018 yearlings ewes available — click on “Sires & Breeding Ewes”. Ewe Breeding Services — for small flocks that don’t own a ram — click on the “Sires & Breeding Ewes” tab. Please Note in 2019 schedule early — we can only take 14-16 ewes to breed for small flocks. On-Farm Processing Resources — do you want to do your own slaughter? We’ll refer you to a farm in Westminster, MD that has the facilities to do on-farm slaughter of lambs and goats. Suffolk and Hampshire Fleeces — skirted, classed, clean fleeces for hand spinners. Greek Easter Lambs. Greek Easter is April 28, 2019 this year. In 2020 Greek Easter is April 19, 2020. Ram Leasing Services — for small flocks, with an experienced shepherd, if we have an available ram. We’re a resource when you have a question, health problem, plan to start or improve a sheep flock. Please call Peter or Kelly. We’ll try to help — might save you a vet call. Aged Sheep Manure (compost) — we’ll load your truck — a full-size truck holds 3-4 cu. yards. 1. Custom-Processed Lamb — call or email to discuss what you like — farm-fresh lamb for individual customers. Will email you an Order Form. Our lambs are custom-processed, vacuum-sealed, and labeled at Hemp’s Meats, in Jefferson, MD 21755. Website: Hemp’s Meats, Jefferson, MD We’ve been working with Hemp’s to do our processing for the past 30+ years. 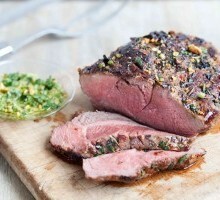 Click on our “How to Purchase” tab to order a lamb. Recommend ordering your lamb weeks in advance. A Crown Rack of Lamb, or Double English Loin Chops, and 1½” thick Rib Chops are great for that special dinner party. Order early — Hemp’s is very busy in the Fall months. By December, lambs born in February and March will be 9-10 months old. • Sweet Italian Lamb Sausage and Maple Brown Sugar Lamb Sausage. Available in 1 lb. to 1.5 lb. packages — 4 links per package — $11.00 lb. 5 oz. Lamb Burgers — $10.00 lb. Call to order: 301-371-4111. • One great way to BBQ a lamb. For information on China Box Roasters, click on: China Box Roasters — available at Home Depot and on-line. Also, Google “China Box Cookers” — for a list of resources, recipes, making your own China Box, etc. 2. 4-H Project (Market) Lambs. (also called 4-H Club Lambs): Need a Market Lamb for your 4-H Project? Call to arrange to visit, evaluate and pick-out your 2019 4-H Project Lambs to be shown at your County and State Fairs. We have a very good selection of wethers to choose from. 3. 4-H Lamb Leasing Program. We lease (loan) very good registered ewe and ram lambs to 4-H’ers to raise and show at their County Fair and other Fairs. Then the 4-H family returns the lamb(s) in the Fall after showing at various Fairs — and transfers the lamb’s registration papers back to us (Kelly Vorac). Interested — call us — 301-371-4111. 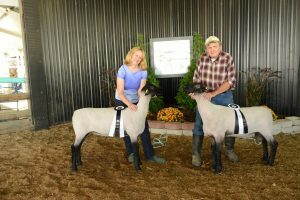 • We follow-up with 4-H’ers and their parents: We follow-up and are glad to help families who purchase and lease our 4-H Project Lambs and breeding stock. When a 4-H’er has a question, problem — halter breaking, exercising, what to feed, lamb not eating, high temperature, shots, rate of gain, anything — call for assistance. We should be able to save you a vet call. 2014 Champion Suffolk Ewe 1441 (Aunt Rose) on left — Reserve Champion Suffolk Ram 1446 on the right, both were 2014 born lambs. In 2017 Ewe 1441 had triplets — she raised all 3 of her lambs. Full grown, Ram 1446 weighs around 330 lbs. 4. Registered Ewe and Ram Breeding Stock. We kept 13 – 2017 registered Suffolk ewe lambs as replacement stock — now yearling ewes, weighing 210 to 230 lbs. — all are registered — ewes that are in our “keeper pen” — sold two in the spring, and three during the summer. These 8 Yearling Ewes will be bred in the Fall to have their first lambs starting in February, 2019. 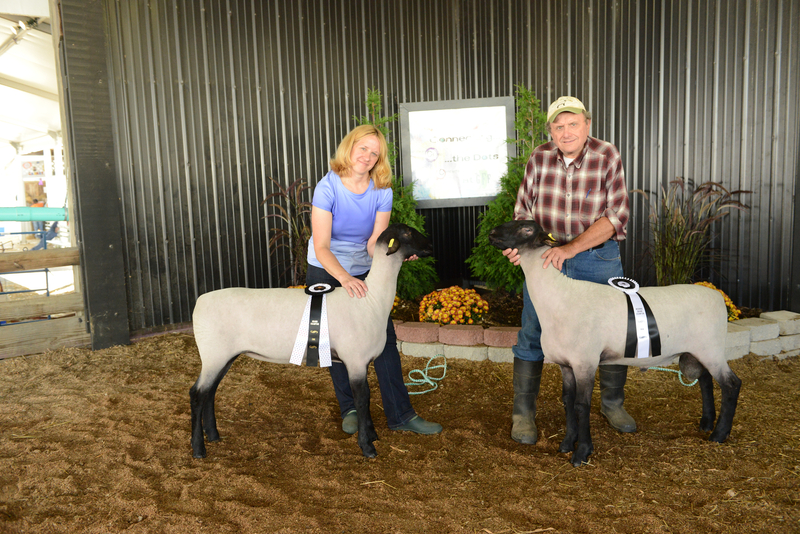 Click on the “Sires & Breeding Ewes” tab for up-to-date information on our breeding rams. • Registered 2018 Ewe Lambs and a couple of Ram Lambs. • For Sale: Two Registered Suffolk Rams — 1446 RR/NN (4 yrs. old) — and 1538 RR/NN (3 yrs. old) — $450.00 each. Ram 1538 has been sold. Both rams have done a very good job for us and are in great shape. Only reason we’re selling is that we’re bringing in some new genetics to compliment what we have. 5. Ewe Breeding Services. For shepherds with small flocks and just a few ewes — when the shepherd does not want to own a ram — click on the “Sires & Breeding Ewes” tab. The maintenance and feeding cost for a full-grown Suffolk ram is at least $350.00 pr year. Example: our full-grown Suffolk rams eat 5-6 lbs. of grain per day, ram lambs fed a bit less. For small flocks it’s usually not worthwhile to own a ram. For more information go to the “Sires & Breeding Ewe” tab. • Contact us to schedule breeding services for your ewes in the summer of 2019 — for your 2020 Spring lambs. This summer — call to set-up breeding dates for your ewes — based on when you want lambs to be born in 2019. Breeding costs are the same: $70.00 per ewe, plus the same $1.00 day for hay, grain, worming if needed, any shots needed, and minor vet care that we can take care of. Ewe must be in good shape — not too fat, or very thin, sheared, feet trimmed, up-to-date on CD&T shots, wormed, no foot rot, no Ring Worm, no skin infections that are contagious. 6. If you require On-Farm Processing — ⇓⇓ contact the farm listed below — they have the proper on-farm slaughter and wash-up facilities ⇓⇓: Lambs, goats, sheep can be purchased and processed at the farm. You must know how to properly kill a lamb or goat — and clean-up all the parts of an animal. Or, the owner will kill the lamb or goat for you. • Caanan Run Farm, Westminster, Carroll County, MD. Excellent resource. Farm has the proper on-farm processing facilities to process lambs, goats, and adult sheep. Believe they charge around $3.00 lb. live wt. for lambs. Processing is $40.00. Not sure if they have chickens. Phone Earl Gouker: 1-443-506-5243. Address: 1661 Old Westminster Pike, Westminster, MD 21157. Use MapQuest for directions. 7. Suffolk and Hampshire Fleeces. Skirted fleeces, fairly clean, good crimp, bagged individually, works well blending with other yarn types. Suffolk fleeces, $4.00 lb., Hampshire fleeces, $5.00 lb. 8. 2019 Greek Easter is April 28, 2019. Plan ahead — order early — we’ll have 70-90 lb. lambs. We’ll take the lamb to Hemp’s Meats. 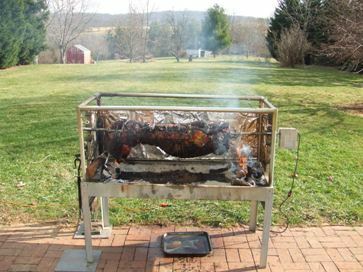 Customer picks up their cleaned lamb carcass by Friday or Saturday, April 26-27. New customers — a $100.00 deposit is required — mail your check to Peter Vorac. Address is in the “Contact” tab. Note: 2019 Greek Easter is April 28, 2019. Order now, so we can breed some ewes earlier in the Fall of 2018 — in order to have a lamb for your 2019 Greek Easter. Sydell 5′ wide x 6′ deep lamb jug shown. Larger breeds should use a 6′ or 7′ wide by 6′ to 8′ deep lamb jugs — so the ewe has plenty of room to turn, and not step on her lambs. 9. 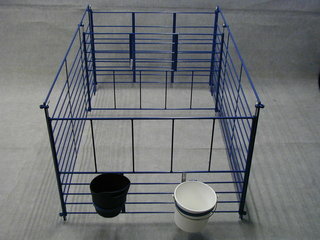 Need some sheep and goat equipment? We’re a Dealer for 3 Sheep & Goat Livestock Equipment Manufacturers: call or send an email with your questions — we’ll assist with your planning. Can provide any kind of special steel and aluminum fabrication to fit your barn space. We’ve been using Sydell steel equipment on our farm for over 30 years. It lasts. Open these 3 websites and enjoy. 10. Ram Leasing Services. If a ram is available — we can lease a breeding ram to an experienced shepherd with a small flock — or, we’ll breed your ewes. 11. We’re a resource and encourage on-going communications with fellow shepherd’s, all customers, the 4-H’ers we work with — and especially new farmers, who are considering raising sheep and goats. What is needed — health care — more than you think. Call Peter and Kelly to discuss your issues. 12. Sheep Manure — Compost, pick-up truck load, $25.00. Pick-up trucks with 6′ to 8′ beds hold 3-4 cubic yards — we’ll load your truck or trailer — or, you can purchase smaller amounts. Arrange to visit the farm. See a working farm, bottle feed and hold a lamb, help feed the sheep. Thinking about raising sheep — we can discuss possible breeds to select? It all depends on many factors — your interests, your land’s soil quality, water, barns, pasture, ability to make hay, fencing, meat breed sheep, or wool breed sheep, producing woolen products — you marketing plan and end goals. Call to make arrangements to visit. Vorac Suffolks & 4-H Club Lambs, at Castle Hill Farm, is a Suffolk sheep breeder and lamb producer located in Jefferson, Maryland (southwest of Frederick), in Frederick County, Maryland. The owners are Peter & Kelly Vorac. We believe in a dual purpose sheep. Our goal is to produce Suffolk sheep that excel in the traits that have made the breed popular, producing fast growing lambs, with well-muscled carcass composition. Maternal Performance — ewe must milk well, watch over her lambs, no bottle babies. Structural Soundness — good udders, growth, and good loin eye measurements. Structural Correctness and Eye Appeal — no defects in legs, hocks, mouth, no false teats, etc. Vorac Suffolks look flashy in the show ring with their thick loins and full legs. Exceptional Lamb Carcasses — well muscled, good size lamb chops, racks, steaks and roasts. We specialize in supplying whole or half custom-processed lambs, 4-H club lambs, and registered breeding stock. 90% to 95% of our flock are RR at Codon 171 for genetic resistance to Scrapie. All sheep are NN and carry the spider-free genotype. Give us a call. Come out to visit, see the baby lambs — and talk “sheep”. Establish on-going communications. We might have a pitchfork with your name on it. Our farm was settled in 1813 and originally owned by Judge Dewalt Willard and his family, from Frederick, Maryland. The Willards named the farm Castle Hill Farm. The farm is located in the beautiful Middletown Valley, north of Burkittsville and south of Middletown, Maryland. We are the 4th. owners from the original land grant in the late 1700’s.. Example of our on-going communications with 4-H families. Martin & Mitzi Hardy, parents of a 4-H’er visiting one weekend. Mitzi is holding an 11-day old lamb. Frisk, one of our Border Collies, is helping out. We were a bit late in docking this lamb’s tail. The 14 lambing jugs are behind Frisk, inside the bank barn. The farm was a dairy farm up to the late 1960’s, when Emery Ahalt (former owner) stopped milking and sold his dairy herd. The farm was then leased out to Ford Harwood, the neighboring dairy farm to the north — up to when we purchased the farm. Our farm is a working farm with sheep, lambs, barn owls, bee hives, barn swallows, a fish pond, at times beef cattle, clean, well-managed pastures, a rotational grazing system, various soil conservation practices, too much work, not enough money — and fences that need fixing. The farm is managed by border collies Frisk, and Kelly’s dog Sadie, who watch over the ewes and lambs. Buzz, Snow, Jake, Jack, Mia and Shelby, our former border collies, are buried on the farm.